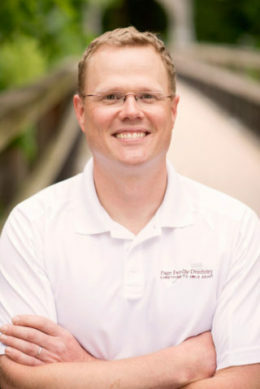 Dr. David Page is a lifetime resident of River Falls, a graduate of River Falls High School, the University of Wisconsin – River Falls and Marquette University School of Dentistry. Dr. Page has been a dentist since 1979 and is especially proud of the wide range of dental services he provides at his dentist office. Cosmetic dentistry, oral surgery, endodontics, orthodontics, complex restorative dentistry, implants and implant restorations, endodontic surgery, the entire range of preventative dentistry services, and many other dental procedures and services are available. Dr. Page has been recognized by the University of Minnesota School of Dentistry for his accomplishments in continuing education and contributions to continuing dental education. He and his wife Alison are proud of their five children whom they raised in River Falls and of their continuing community service. 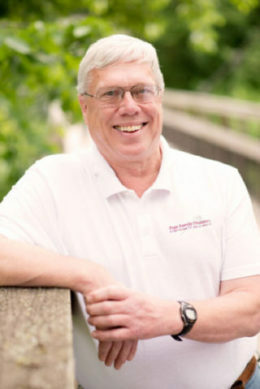 He is a past president of the River Falls Area Chamber of Commerce and past chairman of River Falls Days. He was a volunteer hunter safety instructor from 1991 to 2016 and was the River Falls director of hunter safety from 1999 to 2016. Dr. Page enjoyed a 28 year career as a high school football official including four state championship games. He has also enjoyed rock climbing, mountaineering, backpacking, wilderness canoeing, whitewater canoe racing, scuba diving, hunting and fishing. Dr. Page is a voracious reader of history, biography, and adventuring. Dr. Page is a member of the Academy of General Dentistry, the Kinnickinnic River Land Trust, Sierra Club and the Nature Conservancy. Dr. Michael Page is is proud to be working with his father in practice at their dentist office at Page Family Dentistry in his hometown of River Falls. Michael was born in and grew up in River Falls and has been an avid fly-fisherman on the Kinnickinnic River since a young age. Most of his free time is spent on the water whether he is wading the Kinni, the Rush or the Brule, or bass fishing on Wappie. Michael and his wife Emily (Schwartz) live on the West side of town just three blocks from the house where Michael grew up. They now have one daughter and two sons. The Page family is excited by the opportunity to move back to their home town where they look forward to continuing to grow their family and community. Michael is a River Falls High School alumnus, a University of Wisconsin – River Falls alumnus, and holds a Bachelor of Arts degree in Philosophy from the University of Wisconsin – Madison. He graduated with distinction in 2011 from the University of Minnesota – School of Dentistry as a Doctor of Dental Surgery. During his dental education Dr. Michael completed more than 20 credits of continuing education courses highlighting his commitment to lifelong learning. Through his clinical experiences both on campus and at numerous outreach clinics throughout Minnesota Dr. Page has garnered a passion for family based comprehensive care dentistry. In 2012 Dr Michael commissioned as a Captain in the Minnesota Army National Guard where he serves as a State Dental Officer with the C Medical Company out of Cottage Grove Minnesota. Michael is the Spokesperson and President for the Friends of the Kinni, the President of the River Falls Lions Club, and a member of the Kinnickinnic River Land Trust, the Academy of General Dentistry, the University of Wisconsin Alumni Association, as well as the University of Minnesota Alumni Association.